Communication is an integral component of education. One effective communication tactic for schools is the use of exterior LED displays, which help keep students, parents, faculty and the community quickly informed about news and events while projecting a modern educational environment. Electronic message centers (EMCs) provide color, light and motion to communicate 24/7, they are energy-efficient, and more effective and flexible than traditional static signage. Additionally, LED displays strengthen and reinforce schools' branding and image while serving as a medium for campus-wide and inter-campus communication. Today's generation of students needs to be captivated and digital signage offers many ways to engage and attract. Images, video, animations and relevant information can be effective ways of communicating with the student body. 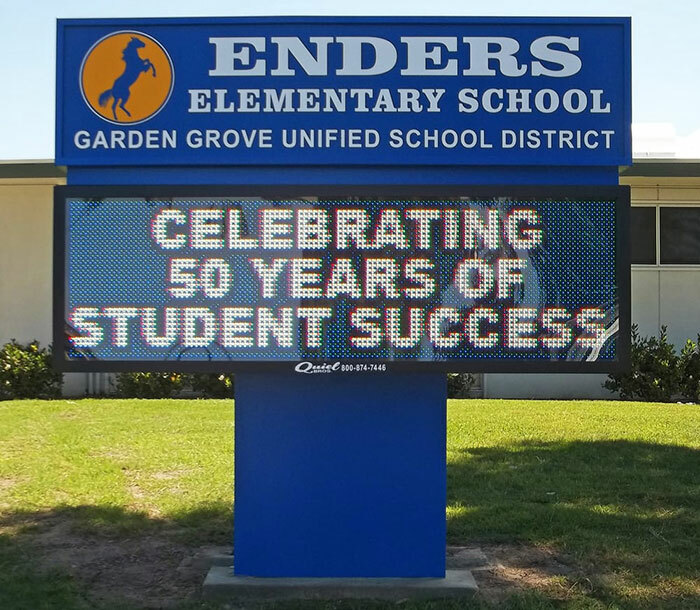 Recently, the Garden Grove Unified School District (GGUSD) in Garden Grove, CA., recognized the need to upgrade and standardize their schools' existing static signs. Comprised of 68 schools, GGUSD is committed to preparing its nearly 45,000 students to become successful and responsible citizens who contribute and thrive in a diverse society. To ensure student success, each school provides a rigorous and supportive academic experience that motivates all learners to meet high expectations. Not only do schools compete with each other on the playing field they also strive to promote innovation excellence through upgraded technology installations. Each GGUSD school wants to keep up with the other, particularly in delivering the best first impression. In California, the Division of the State Architect (DSA) provides design and construction oversight for K-12 schools, including established requirements for sign installations. The code mandates the general requirements of a sign, including location, design, construction, electrical, material, type of sign and uses, and referenced standards. The GGUSD facilities team knew that navigating this process would be challenging and time consuming. To address both the DSA approval process and the schools' needs to communicate effectively and timely with constituents using the latest technology, GGUSD facilities team contacted San Bernardino, CA-based Quiel Signs. As a leading sign installer in business since 1961, Quiel has extensive experience with the DSA and California school signs mandates. The process began with GGUSD selecting a basic style that would work with each school, utilizing Quiel Signs DSA pre-approved, sign designs' templates. Using these templates reduces DSA's approval time from one year for custom designs to just 40 days. Quiel selected the full-color RGB Impact Series, choosing 20mm displays. These signs are perfect for the schools because of the smaller size requirements while still offering full-featured video display capabilities. The signs are all hard-wired with ethernet cable. 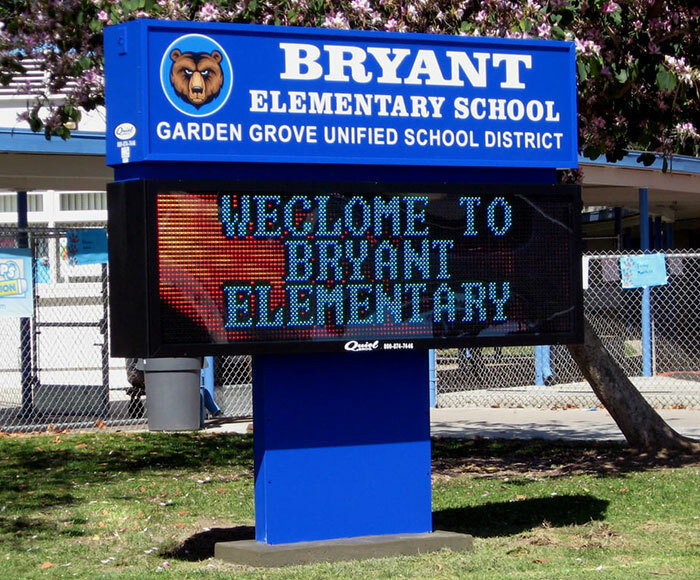 After a two-school pilot program for the district to test the LED display signs' quality and software, GGUSD moved forward and installed a variety of both monument and wall-mounted displays over the course of two years. The outdated placard signs were removed and 50 new signs were installed, which are primarily 2 1/2' x 8' monument style and a few wall-mounted. The EMCs utilize user-friendly software that supports common video formats, such as .AVI, .MPEG, .MP4, .FLV in a simple, easy-to-program interface that allows for content creation and content scheduling. 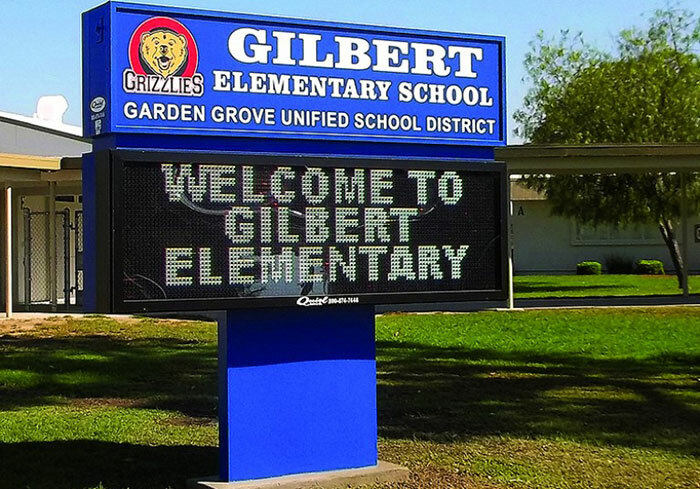 "For GGUSD's 50 schools, using these LED screens provides the quality and flexibility necessary for high-copy visibility and easy changeability," commented Larry Quiel, owner Quiel Signs. A technician was at each site during installations and provided software training, ensuring everyone was comfortable and knowledgeable with programming the EMCs. Additionally, the company stocked the signs at their facility until each school was ready for the installation. "We have received a lot of positive comments on the signs; they really turned out great," commented school administrators. "The LED displays are an excellent way to communicate quickly and effectively with our students, parents, staff and community," administrators said. Ashish Shah is Territory Manager at Optec LED Displays, Inc., and has worked in the industry for 17 years and may be reached at ashah@optec.com or 800.876.1668 x108Optec is an industry-leading LED display manufacturer. For more than 30 years, Optec has engineered and manufactured a wide range of ultra-bright, high-performance LED displays for various applications and continues its reputation for Innovation in Light(tm). Since 1985, the company's wide array of products spans high-growth markets from indoor spectaculars to outdoor displays. Optec's LED solutions work to give clients increased visibility and lasting value through innovative products, services and support. For additional information, please visit www.optec.com.